Exclusive! Added world's first "Reset FRP" for Android 7.x firmwares! 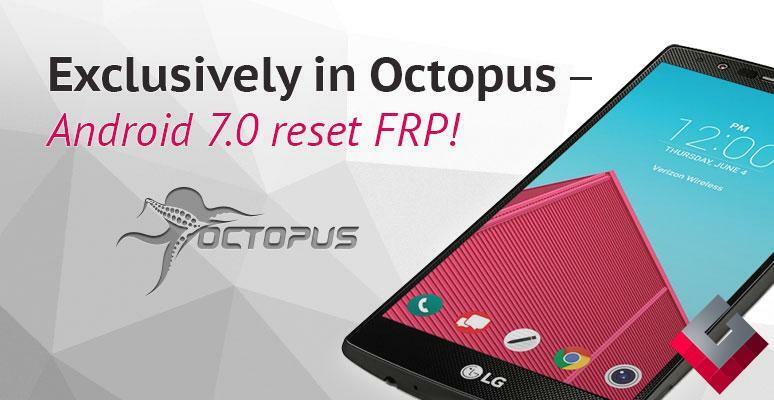 You can also perform "Reset FRP" operation for other, not listed above models with Android 7.x firmwares and post the result for all Octoplus users. * Note: "Reset FRP" operation will delete all user data on the phone (contacts, pictures and others)! - M154 - added Direct Unlock, Repair IMEI, Reset FRP, Write Firmware, Read/Write NVM, Read/Write QCN, Read/Write/Reset Security, Read Full Flash, Repair BT/Wi-Fi MAC Address (thanks to mr. Jay da). - LS997 - added Direct Unlock, Repair IMEI, Reset FRP, Write Firmware, Disable Hands free activation, Repair MEID, Repair AKEY/SSD_A/SSD_B/OTKSL/SPC, Read/Write NVM, Read/Write QCN, Read/Reset Security, Read Full Flash, Repair BT/Wi-Fi MAC address (thanks to mr. Kw.). - MS330 - added Reset Screen Lock (thanks to mr. shehryar_khan). 🐙 Improved "Write Firmware" operation for K410x series.